Earn up to 2,152 reward points. 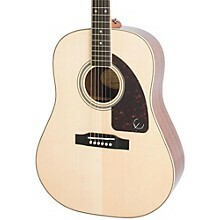 Sitka spruce top and luxurious appointments in an Epiphone guitar offered at a steal. From Epiphone comes this beautiful entry-level guitar, priced for anyone to afford. Dressed in a beautiful finish, and featuring appointments you'd often find on higher-end guitars, the Epiphone AJ-220S guitar sounds just as good as it looks. Built on advanced jumbo body design, the depth of the body and the width of the shoulders create a large sound chamber, presenting tone that is full, deep, and loud. The mahogany back and sides paired with a solid Sitka spruce top brings out rich harmonics, lots of projection, and clarity in tone. A glued-in dovetail neck joint keeps the Epiphone acoustic guitar's neck and body stable, without losing any subtleties in tone. The mahogany neck adds strength, as the wood is quite durable and will stand up to the elements. The rosewood bridge and fretboard produces lasting sustain, in a deep appearance. Dressed in a polyurethane finish and featuring such desirable appointments as sealed die-cast tuners and nickel hardware, you will love the look of the Epiphone AJ-220S guitar as much as its sound. Built under the expertise of Epiphone's master craftsmen, this acoustic guitar will sound excellent for a very long time. And at this price, you can't go wrong. Don't miss out on a great deal. 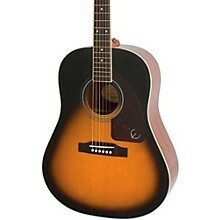 Purchase your Epiphone AJ-220S acoustic guitar today.